The Mad Clown (Maccus demens) is a boss-monster that may be encountered at the end of the mini-quest "Fear nothing but fear itself, and clowns." This mad clown used to be a just a sweet transvestite from the planet Transsexual Transylvania until one day, someone brought him a tomato and cream cheese sandwich with the crusts still on. His therapist had been telling him to show his true emotions rather than holding them all in, so he knew what he had do. He decided to finally take his own advice of "Don't dream it, be It..." which he had sang on screen so many years ago. 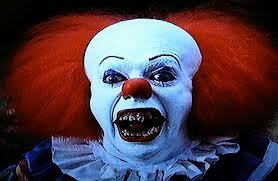 Thereafter; he became the child-eating, shape-shifting clown we all know and love. Secretly is afraid of itself. This page was last edited on 21 February 2019, at 14:37.